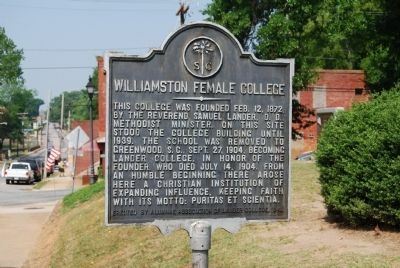 This college was founded Feb. 12, 1872, by the Reverend Samuel Lander, D.D., Methodist minister. On this site stood the college building until 1939. The school was removed to Greenwood, S.C., Sept. 27, 1904, becoming Lander College, in honor of the founder, who died July 14, 1904. From an humble beginning there arose here a Christian institution of expanding influence, keeping faith with its motto: Puritas et Scientia. Location. 34° 37.107′ N, 82° 28.713′ W. Marker is in Williamston, South Carolina, in Anderson County. Marker is on West Main Street (State Highway 20) 0 miles east of Minor Street, on the right when traveling south. Touch for map. Marker is located in front of the Williamston Municipal Complex. 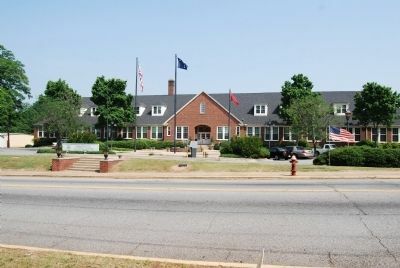 Marker is in this post office area: Williamston SC 29697, United States of America. Touch for directions. (within shouting distance of this marker); West Allen Williams Memorial Gravesite (within shouting distance of this marker); Confederate Skirmish (within shouting distance of this marker); West Allen Williams (about 500 feet away, measured in a direct line); Williamston (about 600 feet away); Big Creek Baptist Church (approx. half a mile away); Pelzer Presbyterian Church (approx. 2 miles away); "Lord, We Are Grateful" (approx. 4.7 miles away). Touch for a list and map of all markers in Williamston. Regarding Williamston Female College. The Lander motto, Puritas et Scientia, means "Purity and Knowledge." — Submitted May 24, 2009, by Brian Scott of Anderson, South Carolina. More. Search the internet for Williamston Female College. Credits. This page was last revised on June 16, 2016. This page originally submitted on June 6, 2008, by Brian Scott of Anderson, South Carolina. This page has been viewed 1,332 times since then and 4 times this year. Last updated on June 20, 2008, by Brian Scott of Anderson, South Carolina. Photos: 1. submitted on June 6, 2008, by Brian Scott of Anderson, South Carolina. 2. submitted on January 5, 2009, by Brian Scott of Anderson, South Carolina. 3. submitted on June 6, 2008, by Brian Scott of Anderson, South Carolina. • J. J. Prats was the editor who published this page.